플로리다의 스트라우트에 있는 회사에서 관리하고 있는 파워요트이다..
선상에서 만났을때의 감흥은 감각을 고조시키게 마련이다..
각종 전자장비들의 게이지들이 디지털로 캡틴에게 보고를 한다. 어느 한곳 험잡을 구석을 찾을 곳이 없다..
플라이브릿지를 이루고 있는 브릿지 콕픽에 오르면..
LOA: 80' Beam: 19' 4" Draft: 5'11"
Not your ordinary 80 footer...this vessel is packed with custom options. 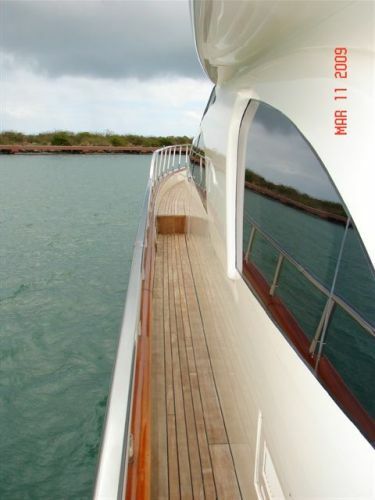 Classic and elegant, with high gloss cherry walls and bulkheads, accented by upgraded fabrics throughout the entire vessel. 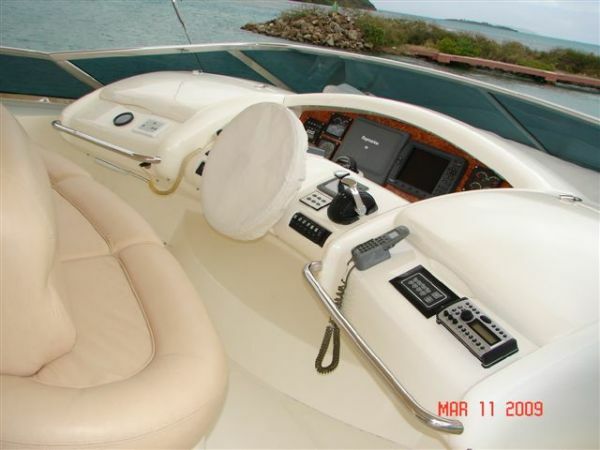 Entering from aft deck find entertainment center aft to port which contains a hi/low 42" plasma TV, with surround sound. 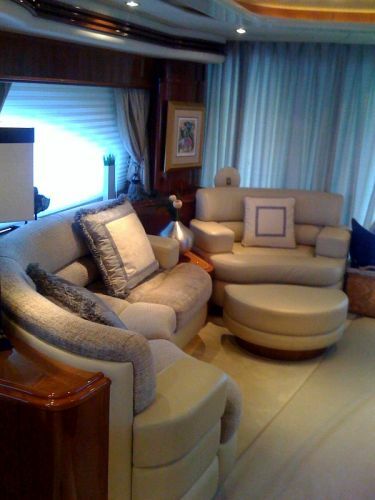 Custom curved sofas forward and on both port and starboard side. 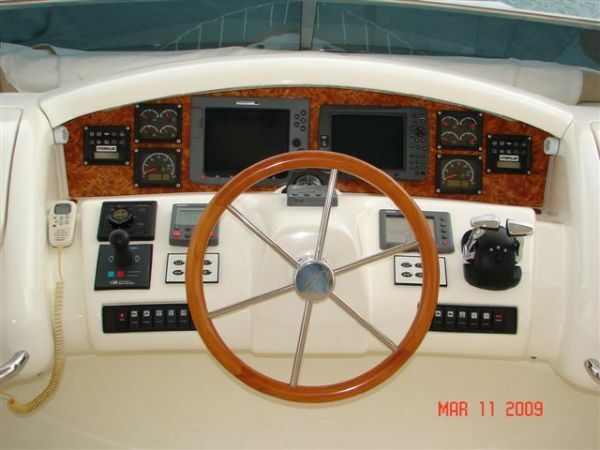 The entire decor package is highly customized and of the highest quality. It includes custom pleated curtains; draperies; decorative lamps and art lights. 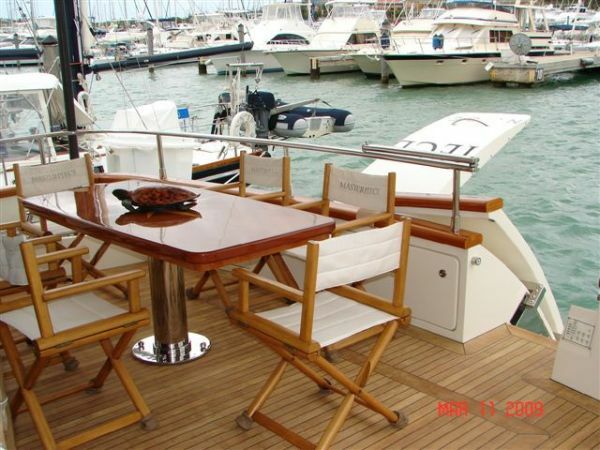 The galley offers a full oven, 2 microwaves, cook top stove, stainless steel refrigeration and freezer units, trash disposal, ice maker all surrounded by custom cabinets and granite countertops. The dining area just forward of the salon features a leather wrap around banquette; pull up chairs and an adjustable table. Seats six. 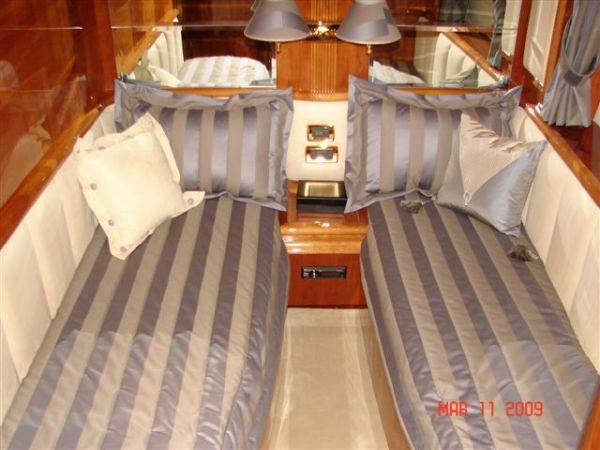 The master stateroom boosts a full beam master with center line king berth in the widest portion of the yacht. 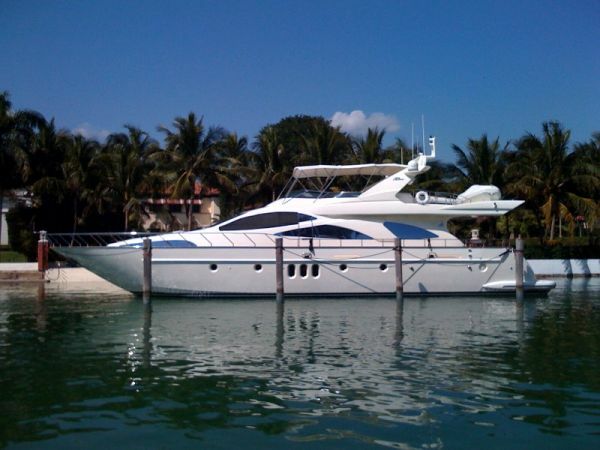 It features a huge walk in closet and large en-suite head with marble counter tops and floor. A custom vanity and drawers in lieu of the mini sofa, and a full audiovisual package including 23" flat screen TV, AM/FM/CD & DVD. 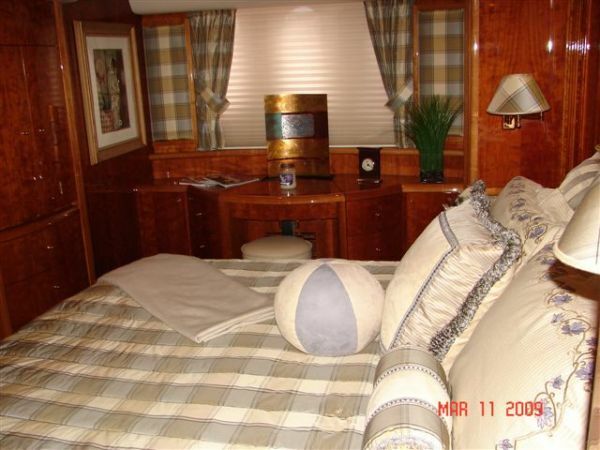 VIP stateroom is located forward and features an island queen berth, walk in closet, en-suite head with a stall shower marble counter tops and floor. There is an abundance of storage in all drawers and lockers. 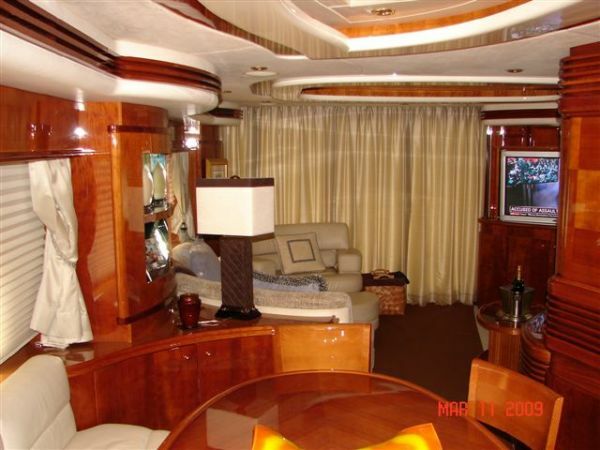 The VIP is also equipped with flat screen TV, AM/FM/CD/DVD player. 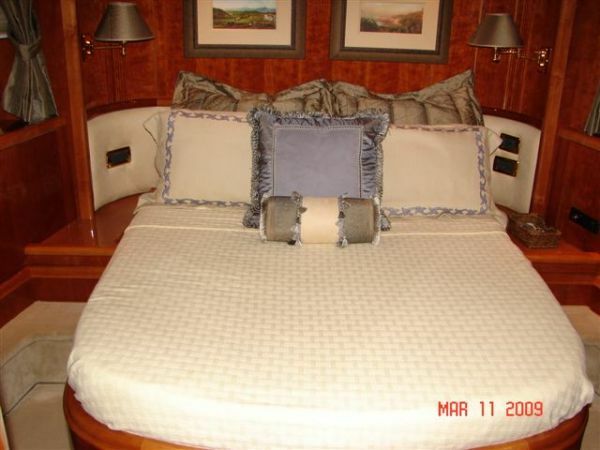 To starboard is also a large guest stateroom that features side-by-side twin berth, hanging locker, an en-suite head with marble counter tops and floor. Many drawers and lockers as well as a 15" flat screen TV, AM/FM/CD/DVD. 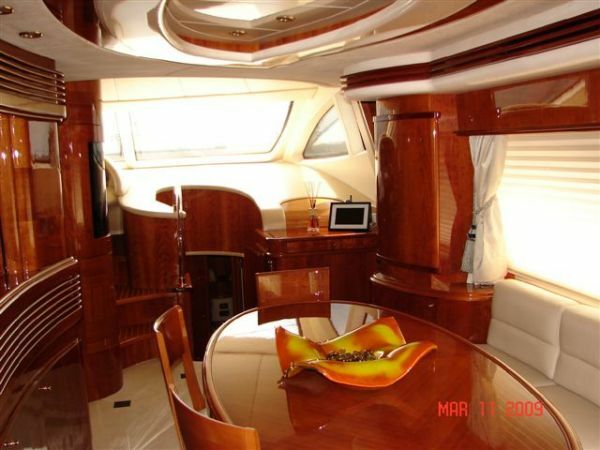 Crew Quarters are accessed via either the stairs found in the after portion of the galley or through the transom door and through the engine room. 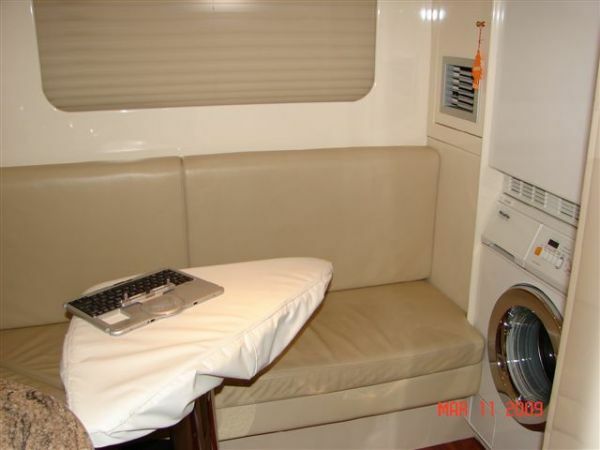 Crew quarters feature over/under bunks. 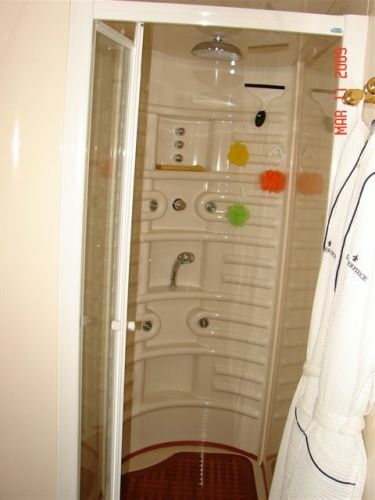 There is a full head with stall shower. 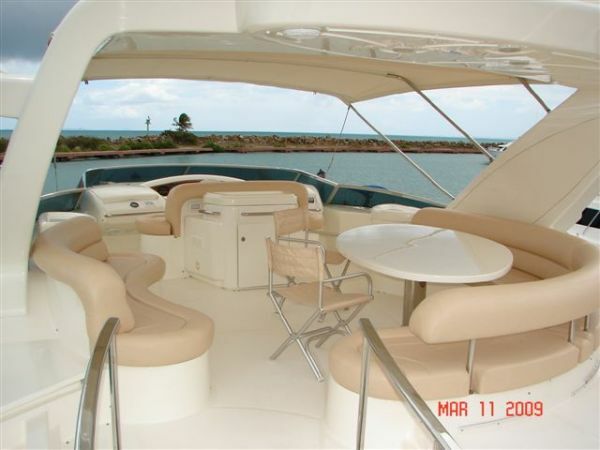 A Galley with refrigerator, microwave, cook top, washer and dryer as well as a seating area with table. 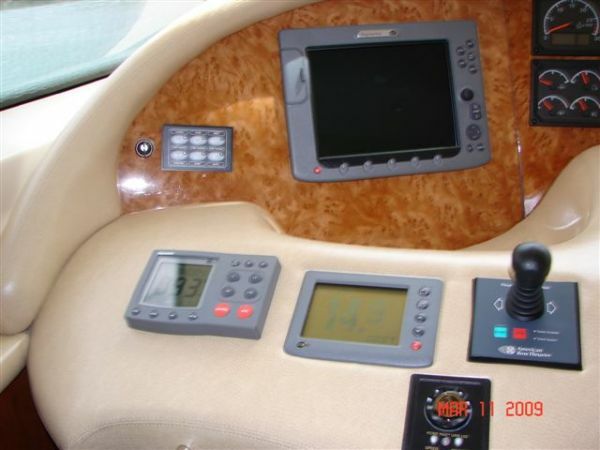 The crew area also features a 13" flat screen TV with AM/FM/CD & DVD player. 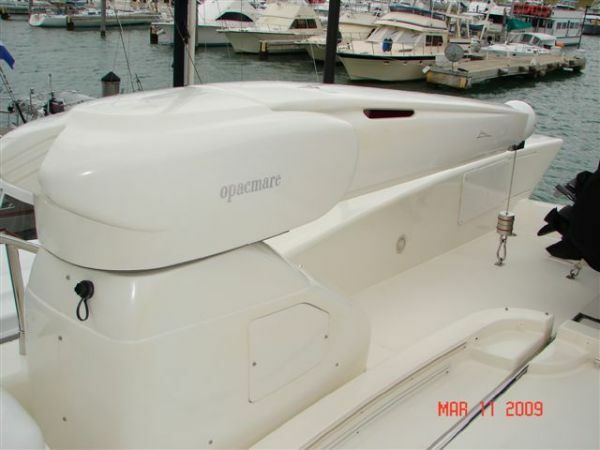 Twin 1500 lb warping winches aft deck corners. 등록된지 10년이 지난 게시물입니다. 거래에 참고하시기 바랍니다.